Series at Miller Park this afternoon. The love/hate relationship between the two has been there for some time, but Nyjer Morgan taking on Chris Carpenter and then Albert Pujols during a recent regular season matchup has only fueled the fire. Morgan exchanged insults with Carpenter and then challenged Albert Pujols when he came flying in. After the on-field show was done, Morgan than had more words for Pujols on Twitter. Tony LaRussa has certainly added to the mess, stoking the flames when he made remarks about the Brewers untucking their shirts in their post-game victory celebrations. The last time the Cardinals were in Milwaukee, LaRussa even complained to Major League Baseball about the lighting on the ribbon panel being different when opponents are batting. It’s LaRussa’s petty whining that has led Brewers fans to dislike the Cardinals and their manager with a passion. On Saturday, Zach Greinke decided he needed to add to the mix by telling people why Chris Carpenter is so disliked by major league hitters. When Tony LaRussa got wind of Greinke’s comments about Carpenter, the Cardinals manager offered his own thoughts. Soon, all of these antics will be done and the two teams will get after it on the field. And I would imagine new lines in the sand will be drawn and a whole bunch of new insults will be uttered in both directions. But it does take two to tangle. I think Tony LaRussa has a tendency to take things overboard. He’s a respected manager, but not one that is necessarily well liked around the league. With that being said, the Brewers and their Beast Mode antics. The Brewers are rallying behind it and their fans love it. But players around the league think it’s bush-league. Some of the thinks the Brewers have pulled in recent memory is no better than some of Chad Johnson’s (Ochocinco) antics in the NFL. What everyone has to remember is this. Times have changed. Most baseball purists are long gone. These are different times and if you’re going to walk around being offended by every little thing a player or team does, then it’s going to be hard to come to the ball park everyday. On the field, this NLCS should be one for the memory books. The managers, players and their fans need to stop worrying about what’s being said and just simply enjoy the games. These aren’t the Yankees or Dodgers or Red Sox. These are midwestern teams Milwaukee and St. Louis, right in the hear of America. Let the games begin. St. Louis will send LHP Jaime Garcia (13-7, 3.56 ERA) to the mound against Zach Greinke (16-6, 3.83 ERA) of the Brewers to the mound. First pitch time is 3:05. 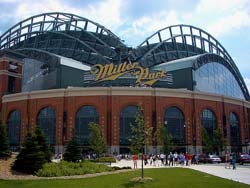 The Brewers have home field and enjoyed a 57-24 record at Miller Park during the regular season and a 3-0 record in the post-season. If Milwaukee can win the NLCS, then they would have home field edge in the World Series as well, based on the National League winning the mid-summer all-star game.